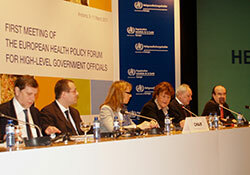 In Andorra, the first meeting of the European Health Policy Forum of High-level Government Officials opened on 9 March 2011, to launch a two-year process that will shape Health 2020, the new European policy for health. High-level representatives from almost all the 53 Member States in the WHO European Region were present, and concerns and questions about the process developed into an exchange of ideas, experiences and cautious hopes. The Forum was opened by Mr Jaume Bartumeu, Prime Minister of Andorra, who stressed the human right to health and the need to find efficient and effective solutions to current challenges. Society’s needs – and requests – needed to be met, he commented. Ms Zsuzsanna Jakab, WHO Regional Director for Europe, explained the rationale behind Health 2020. While health used to be seen as a matter of health facilities always demanding more resources, those days were gone. Health was an important human right. It had many determinants, and was one of the key drivers of human and societal advances, as well as one of the most important outcomes. Investment in health and health systems was critical, but now seen in a more nuanced way. Health had always mattered to individuals: being ill was frightening, and services would always be important. Nevertheless, new thinking was needed for new challenges and trends. Health should be seen as a whole-of-government responsibility. Health 2020 would offer a new vision, a practical approach and tools to help the Region look at health policy and how it was made. It was time to coordinate a coherent response to the current situation and plan for the next 10 years. New and innovative policies were needed; the focus would be on what could and should be done, with the health system offering a leadership role across sectors. Health was everyone’s business, and all must be responsible. The success or failure of Health 2020 lay in partnerships and alliances, in the hands of the officials in the Forum, and their ability to mobilize their countries and societies to contribute to its development and implementation. Many people in the Region did not enjoy the health they should, given current knowledge and technology. Health 2020 was about changing this unacceptable situation. Ms Jakab concluded by identifying WHO/Europe’s main strategic directions: Health 2020 and strengthening health systems with a strong public health component; implementing the Tallinn Charter; and emphasizing noncommunicable diseases. This work needed new and strong leaders who were able to deal with complexity, ambitious yet realistic, focusing on the achievable while reaching out for the visionary: the strongest leadership for health. Member States discussed their initial responses to and the purpose, likely outcomes and potential of Health 2020. Dr Agis Tsouros, Head, Policy and Cross-cutting Programmes and Regional Director’s Special Projects at WHO/Europe, defined Health 2020 as about promoting better health and well-being. There were concerns about sustainable financing, epidemics, public health, and how and when to play the public health card, given the accumulating evidence on health determinants. Working with other sectors was difficult but fundamental. The world was changing fast, so governments needed to respond in innovative ways. This was a pragmatic approach, bearing in mind the economics of health. Solutions had to be found to ease the pressure on health systems from the demands of an ageing population. Health 2020 would be a unifying, value-based, overarching framework, created through a truly participatory process, going beyond traditional boundaries. The Forum participants had to be able to find smart solutions to complex problems, identifying the most promising interventions; and decide how to prepare for the next 10 years and take action against inequalities, and what WHO should do. The main products of the process would be a policy document; a series of policy papers with evidence, argument and tools; and reports on the review of social determinants of health and health governance in the Region. Participants from a number of countries described their current health plans and endorsed the idea of a courageous and ethical new vision for health policy, describing some of their own experiences, responses and thoughts. There was interest in sharing experience with what had and had not worked at the national or local levels in countries. WHO was in a unique position to make these links. The day ended with a session on engaging Member States in the Health 2020 process. Four main ways were suggested: through advocacy, knowledge generation, capacity building and becoming Health 2020 pathfinders. The many ideas generated and the engagement within and outside the conference hall showed that the Forum had already embarked on that task.